When you initially start the game, you are forced to click the Properties you own to generate revenue. With the purchase of a CEO, this process becomes automatic. That is, the CEO will operate the property - the CEO will click the property for you. However, the CEO isn't perfect, and as such has some idle time between ticks. The delay between clicks depends on the level of the CEO. On the Game Help page in the CEO paragraph it says the following: however the CEO will never be perfect, so you can still manually click on properties to make them run faster, This is true, however as the level of the CEO progresses the time delay becomes very small. The formula used for the CEO idle time is Investment-Time / CEO level. As you buy a higher CEO level, you realize diminishing returns. 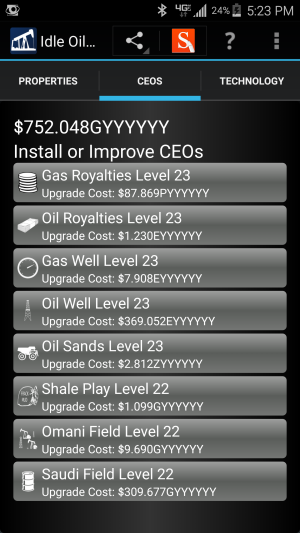 For example, "Gas Royalties" without any speed bonus achievements takes 2 seconds to complete. Without a CEO you will be forced to click to gain revenue However, if you buy a Level 1 CEO, this means the property will run, then it waits 2 seconds idle and it will automatically run again. In the below table, the delays below are shown are not modified by the speedbonus. This page was last modified on 19 October 2018, at 14:59. This page has been accessed 77,983 times.